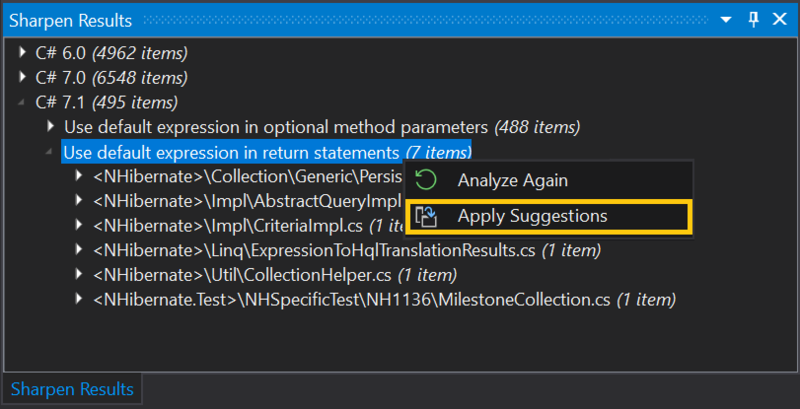 A Visual Studio extension that intelligently introduces new C# features into your existing code base. February 17, 2019 Just on time! Sharpen v0.8.0 is out, bringing support for Visual Studio 2019. November 18, 2018 Run Sharpen analysis on an arbitrary scope. October 8, 2018 Await task instead of calling Task.Result. October 3, 2018 Improve your code performance with Sharpen v0.6.0 Async and Await suggestions. Sharpen can refactor your code on an arbitrary scale. At the same time, it gives you full control over the scope and nature of the refactorings. Sharpen is available on the Visual Studio Marketplace. 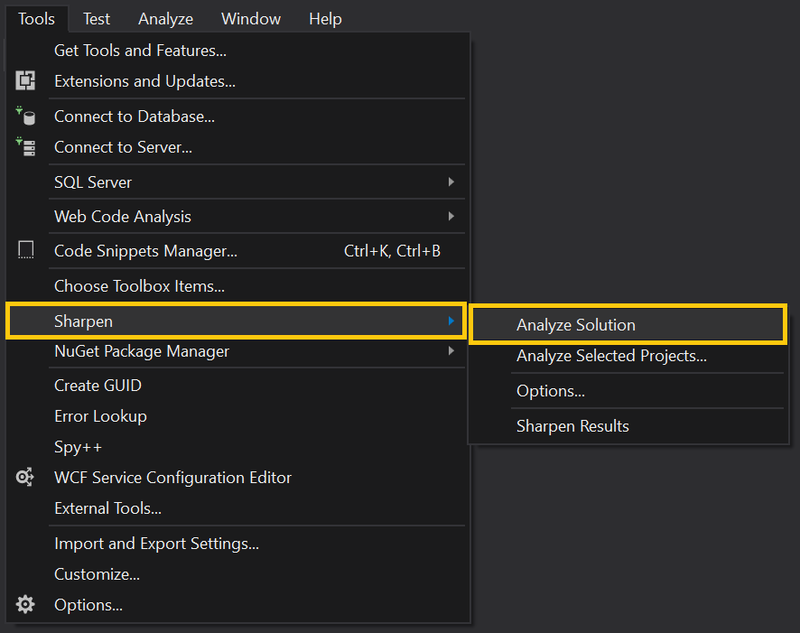 Install it directly from Visual Studio by using "Tools -> Extensions and Updates" or download it via the below link. Start Sharpen analysis on your existing code. The bigger the code base, the better. 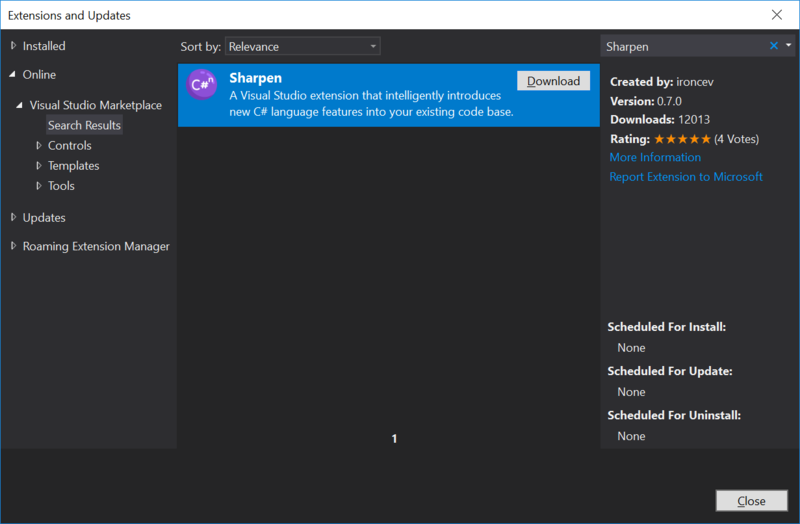 Sharpen will search for places in the code that benefit of introducing new C# features. Take a look at the Sharpen Results view. Compare the existing and the "sharper" code. Use built-in C# documentation and Sharpen's suggestons to learn more about new C# features. Let Sharpen refactor your code. Don't worry. 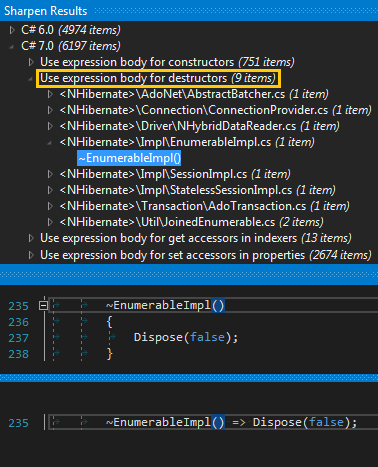 Sharpen by default refactors only the parts of code that clearly benefit of introducing a new C# feature. Works freaking fast on laaarge solution. Very usefull, finds lot of lines that are waiting for improvement and give us smart hints for code cleaning/upgrading. Sharpen is open-source and completely free. Made with ❤ using Hugo and its gohugoio theme.